Where The Sidewalk Ends... “Interurban Trail”, north of Everett Mall Way. 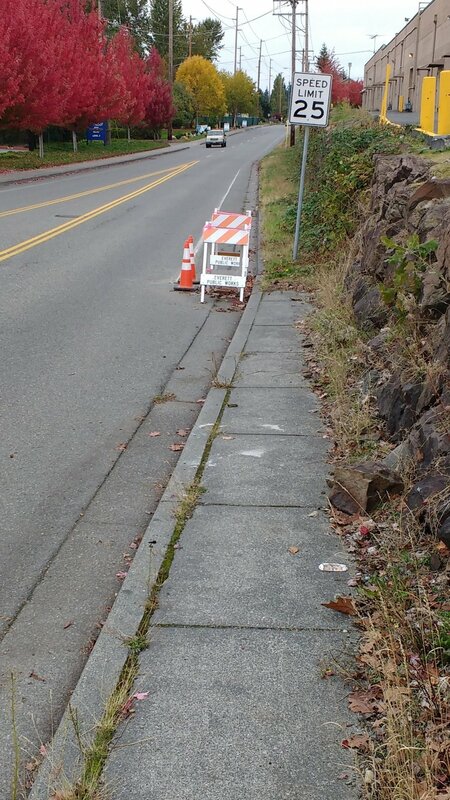 Safety - In the City of Everett many sidewalks are missing, and safe bike route options are few and sometimes far between. We believe a person should be able to safely walk or ride their bike within our city, and car ownership should not be a requirement to ensure personal safety. The City of Everett must commit itself to infrastructure improvements that increase the ability for citizens to walk and bike safely. Personal Health - Most of us want to be more fit and have increased physical energy. We should walk around and ride our bikes more. Exercise produces endorphins, and endorphins make us happier. Community Health - When you and your neighbors are outside walking, you get an opportunity to say hello to one another. Same with biking. You notice things in your neighborhood, and you pay attention to your surroundings. You take a little more ownership of your community. This is impossible when driving past at 30 MPH in a steel box, furtively darting from one conditioned environment to the next. Environment - The earth is pretty big, but it's not limitless. There's a finite amount of oil beneath the crust and eventually our well is going to run dry. While our species has had a great run for the past 100 years, others have not fared well. Many of those species could play an important role our own ability to survive going forward. We have known for 40 years that we should put ourselves on a carbon diet, but we continue to do very little to change our habits. Kids - It would be hard to argue that there has ever been a better time to be alive than right now. (Just think about the Middle Ages!) And hardly a better place to live than Everett. That said, by many measures we've been mismanaging our good fortune. We should hand the world over to our children in better shape than when it was handed to us. We must change our habits to succeed in this. Cost - Many of us live outside of our means, relying on credit to get by and carrying a debt balance from one month to the next. A car, with all of its requisite expenses, is a significant financial burden. Walking shoes and bikes are really cheap by comparison!